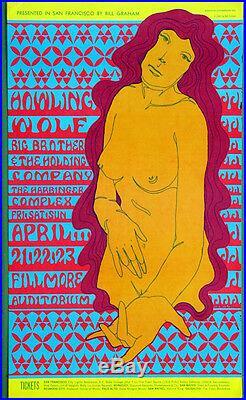 Howlin’ Wolf Big Brother Fillmore Auditorium 4/21 – 23/67 art by Wes Wilson Poster Size: 14″ x 23-3/4″. Description: Original Fillmore Poster, BG-60, 1967, First Printing, advertising by Bill Graham, art by legendary West Wilson for a concert with Big Brother and Howlin’ Wolf. This poster is part of our private collection which we have cello-wrapped and put away in our Gallery’s dark storage for 30+ years. It is very clean & bright & carefully handled over the years in Near Mint (NM) Condition – there are small folds on 2 corners. We can carefully pack 4 posters in the same poster tube for a single mailing price. Please view our selection of. POSTCARDS , PRINTS / Photography /GIFTS. The item “BG60 Howlin’ Wolf BIG BROTHER 1967 Original Fillmore Concert Poster Wes Wilson” is in sale since Wednesday, October 16, 2013. This item is in the category “Entertainment Memorabilia\Music Memorabilia\Rock & Pop\Artists G\Graham, Bill\Posters”. The seller is “mello555″ and is located in Land of Mountain Dog & Rabbit. This item can be shipped worldwide.